Middle school students with The Village School- Pumps and Pipes STEAM Academy took a tour of Port Houston recently. 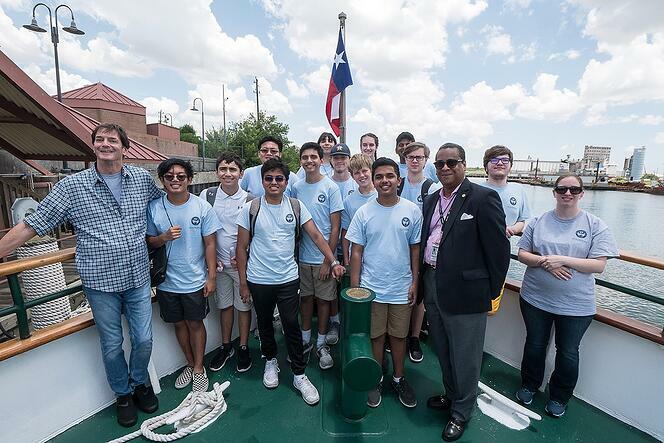 Port Commissioner Theldon Branch III, Chief Commercial Officer John Moseley and Houston Ship Channel Project Manager Richard Ruchhoeft spoke to the students highlighting the background and significance of the port and its economic contributions to the region. “Many of our consumer and retail products come through the port,” noted Branch. Port Houston Small Business Outreach Manager Pedro Garcia and Maritime Education Coordinator Jacquie Young-Hall shared with the students about job and education opportunities in the maritime industry. “There are more than 100 career paths in the port sector,” noted Young-Hall. Port Houston has committed nearly five million dollars to maritime education. The Village School in Houston offers the Pumps and Pipes STEAM Academy, a four-week summer program established in 2017, designed for high school students who are interested in an interdisciplinary approach to STEAM. The goal of the Academy Program is to create curriculum strands that can be translated to school districts around the world. The program is a joint initiative between The Village School and Pumps and Pipes; the consortium between NASA, ExxonMobil, Houston Methodist Hospital and the University of Houston.